Long before the gelatinous geometric monstrosities and semi-aware slimes, iridescent and menacing blobs of goo threatened the lives and sanities of those adventurous enough to probe the depths of civilisations past. While dungeon explorers might consider them an inconvenience at best, possessed of little more than a hunger-driven intuition, Lovecraft served up an insidious and abiding menace. The origin, purpose and aspirations of the Shoggoth remain in question, a subject of studious pursuit by those who dabble in the inscrutable and acroamatic. 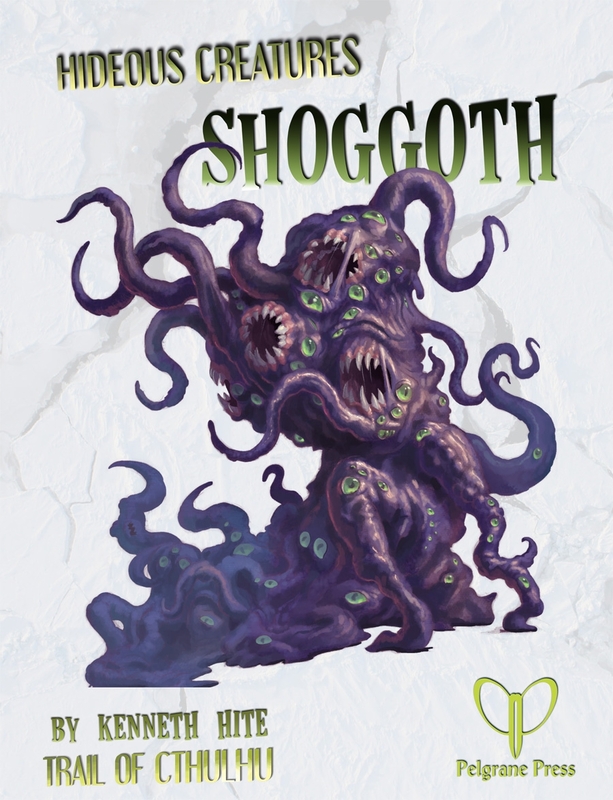 Continuing the monthly series of Ken Writes about Stuff, Hideous Creatures: Shoggoth fills the pages of an 11-page PDF, written by Kenneth Hite and presented in the same style as the Trail of Cthulhu books. Three columns of serif-type text, with clearly headed section, topped with a table of contents and introductory piece on the purpose of the Hideous Creatures volumes. The supplement includes a fine cover illustration of a eye-mouth heavy purple Shoggoth – just the way it should be – with a couple of internal black-white illustrations of explorers coming across or running afoul of the bubbling protoplasmic menaces. Various quotes from Lovecraft’s At The Mountains of Madness pepper the text, highlighting key references to the Shoggoth. Of the many creatures Lovecraft presented to the world in his tales, he seems to have put extra effort into describing the Shoggoth, “a nightmare, plastic column of fetid black iridescence”, “viscous agglutinations of bubbling cells… infinitely plastic and ductile.” You cann get a special appreciation of the eye-watering hideousness and impossibility of these ‘engineered’ tools of the Elder Things. 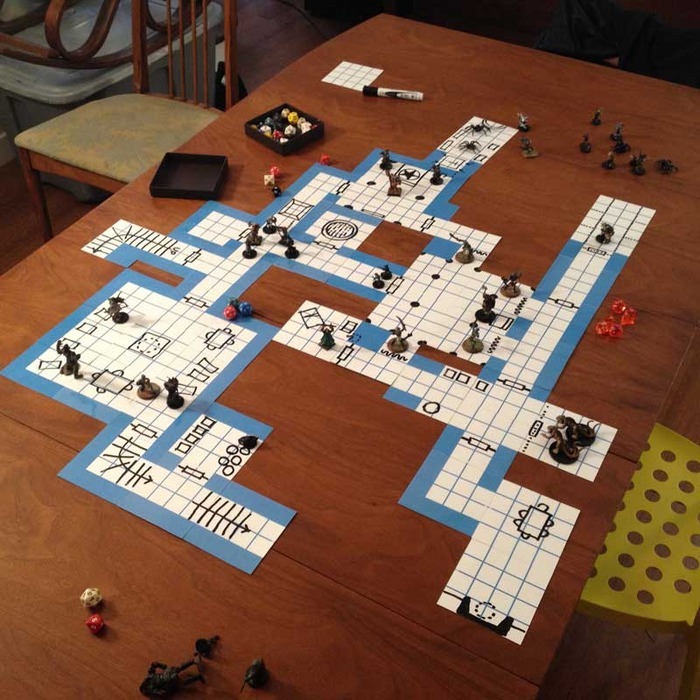 Many traditional fantasy games have looked to take the tired and stereotypical opposition of orcs, goblins, trolls and the like and refresh them to restore their menace and challenge. In the Hideous Creatures series, Hite has taken one of the many creatures, often all too familiar to gamers, from Lovecraft’s series of books and short stories, and sought to recast, reimagine and reevalulate them. Hite provides some detailed consideration of the mechanical rendition of standard Shoggoth, before expanding the threat with Proto-Shoggoth – also referenced in At the Mountains of Madness. The creatures combine Shoggoth and human genetic material with a disturbing level of human cognition and intellect. To mix it up for the blasé, Possible Shoggoth Abilities enumerates alternate and expanded manifestations of faculties. Given the quoted Shoggoth capacity for adaptation, this section rightly has more than a page to itself, covering more than 20 options. If this hasn’t been enough so far to heighten the Shoggoth threat, Variations considers the divergent, contradictory and, often, outright inaccurate information on the creatures. I have struggled to grasp the concept of the setting of Monte Cook’s Numenera lying a billion years in the future – well, the Shoggoth have survived an identical period before our own modern day and brought a wealth of genetic manipulation, absorbed knowledge, and secret agendas along with them. Investigation walks through each and every Investigative skill in Trail and provides a feel of the sort of clues a character with that expertise might uncover pointing to Shoggoth involvement. In many ways, these snippets can serve as a source of ideas to extend and expand upon. Scenario Seeds outlines two fuller proto-adventure outlines grappling with the oozing protoplasmic menace, before Hite then provides an extensive and valuable Bibliography. In the hands of an apathetic Keeper, the Shoggoth can become some tired Black Pudding rip-off or a poor man’s Gelatinous Cube. This horror from ‘At The Mountains of Madness‘ deserves better – and with the plethora of options and variations presented herein, the Shoggoth can remain a Hideous Creature, steaming across the barren and shattered landscape of the Antarctic or sea floor. I consider this series a wake-up call to the lacklustre, to remind them tales of the Mythos, using whatever system, should instil uneasiness, upset and fear. Grasp the potential of the unearthly and inhuman, and make sure next time the investigator’s meet a Shoggoth they have a truly memorable encounter.